In addition to its arrival in Canada, Google's smart speaker has finally received French language support. Sadly, there are only two languages supported by Google Home and Google Assistant right now - English and French. 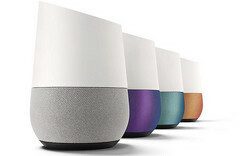 Google smart speaker was released in the United States back in November 2016, followed by the United Kingdom in April 2017. Now, Google Home hits the Canadian market, also adding support for the French language. Google Home pre-orders went live in Canada earlier this month, and now those who ordered from BestBuy.com or the Google Store should get ready to welcome their devices. To get started, the user simply needs to say "OK Google" and then ask for assistance such as checking movie schedules, creating reminders, asking for details about a person or searching for the definition of a certain term. Google Assistant was only capable of understanding English so far, and so French becomes the second language supported. In the coming weeks, quite a few new languages are expected to follow - Brazilian-Portuguese, Italian, Spanish, Korean, and Japanese. Obviously, the countries where these languages are official should get Google Home as well.